There is a demand for the service today: If you’re not offering UCaaS today, it’s likely that your customers are already buying it from providers such as RingCentral and 8X8. These companies are able to offer the services over your internet connections and it’s revenue you’re missing out on. Customers want to buy local: After high-speed internet access, unified communications is the service most in demand, especially in rural areas. We’ve surveyed and spoken to over 20,000 IT decision makers and this is the service they are looking to buy and would prefer to buy locally from a company invested in their community. It’s sticky revenue: A recent article from NoJitter notes that there is “infinitesimal churn” with Unified Communications. Customers like the connectivity features, the professional upgrade it gives their business, and the costs. Not to mention it’s also a hassle to change. It can easily be bundled with high-speed internet access. 5G is on the horizon: Mobile carriers will absolutely look to offer a full suite of connectivity options targeted to business. Local network providers will only be able to compete if they offer services like #UCaaS. The time to start is now. Need help getting this service off the ground? Give us a call (303)-678-1844 or email us hello@roninpbr.com and let’s start talking. 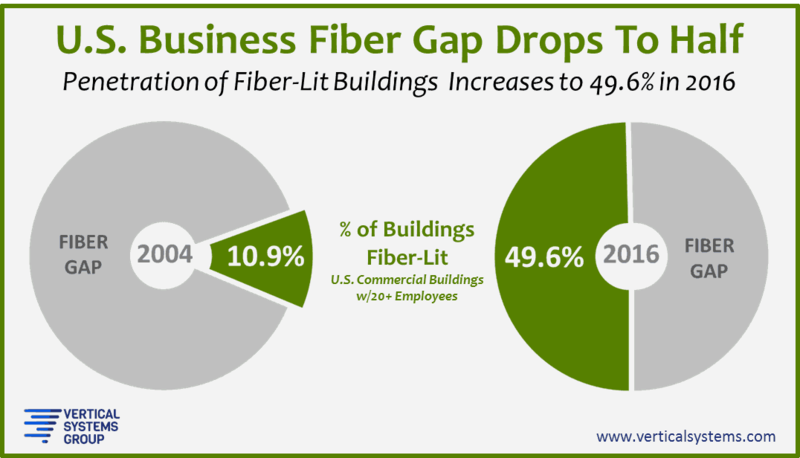 In 2004, a report showed that 90% of office buildings were not connected to fiber. 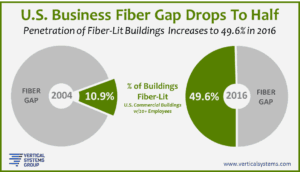 Last month Vertical Systems Group revealed that in 2016 that number had fallen to 50.4%, demonstrating businesses understand the importance of fiber as a basic commercial amenity and strive to obtain it in their own facilities. The main drivers behind fiber adoption are services such as carrier Ethernet, cloud-based applications, Unified Communications or UCaaS, and online business. Depending on the type of work companies do, transactions may depend on split-second data delivery, which only fiber can provide. One of the primary drivers, carrier Ethernet, allows locations and businesses to connect to other office locations, data centers, etc. Carrier Ethernet provides connectivity for cell towers as well as regional municipal and research networks such as FirstNet and Internet2. Carrier Ethernet is not possible without fast, affordable, reliable connectivity, and fiber provides that connectivity. Are you offering or planning to offer these services on your fiber network? If you are looking for ways to increase the return on your network investment, give us a call today and let us help you build and launch the services your community needs.